From 'The Miracle (of Joey Ramone)' to the miracle of 'Electric Co.', has there been a more powerful U2 tour opening than these two songs? Powerful as ever at the first show in Köln tonight, maybe it was something to do with that walk Bono took earlier in the day, out in the wild on the edge of the city, watching the leaves changing colour. 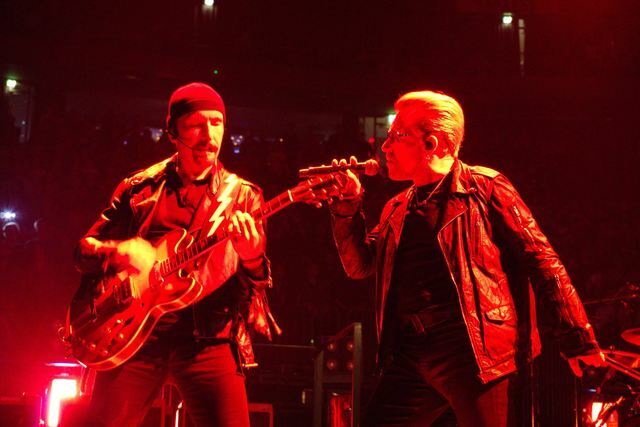 One of those memories was about I Will Follow, the first U2 single released in Germany… and the only song to be performed by the band on every tour since. Before you knew it we were headed down to Cedarwood Road - ‘The journey begins’ as @U2Tour put it. Anna was up on stage to dance Mysterious Ways and shoot the meerkat moment. Anna was wearing her customised shirt, something that Bono noticed. Turns out he wrote it at a show in Germany last year and that Edge and Adam had also signed it… but not Larry. To date. A sharpie was handed to Larry and the autograph set was completed. Edge had The Sweetest Thing and everyone in the house joined in the vocals. More news on the show coming up but if you were there tonight, add your photos and post your comments here. Sorry guys, but this was rather disappointing! Following you for 25 years now, seeing quite a few of your shows but never before had such a bad sound! Music was way too much and Bono - sorry - was quite hard to understand. In addition to that his appearance was too much of everything. Didn't really get in touch with you gyus this time. First show for my daughter. We had GA and stood right up the rail. Bono sang With Or Without You for my daughter. A truly great, gooseflesh performance which my daughter and I will never forget. Can't wait to again next year. This is a family wish here, I will be with my younger brother 42 , my daughter just 20, in London on 29th and 30th. I am an unconditional fan since my teen ages and share this love with my brother and my daughter. "Walk On" is my credo and lifted me up when I was fighting against cancer, and becomes the credo of the 3 of us. It will be the first concert of U2 for my daughter and what a wonderful gift it would be to sing Walk On together there ! Amsterdam ( 9th of september) was the first time me and my wife Peronne saw the iNNOCENCE and eXPERIENCE show and in Koln will be the second. I really hope they play Bad! The first time with my son, for me the fifth time, but stays special. Hopefully they play "BAD".